IN THIS HISTORICAL TALE OF HARDSHIP AND TRIUMPH, DR. LAWRENCE ALLEN ADOPTS THE VOICE OF HIS GRANDMOTHER, PEARL CHAMBERS RAYL, TO TELL THE STORY OF HER LIFE AND THE FAMILY SHE LOVED. At the turn of the 20th century, young couples from Midwestern farms were making the transition to city life, embarking on new vocations in a rapidly changing world. Set in southern Indiana, Pearl tells the story of one American family that learned to work, live, and still remain close during some of America’s greatest trials, including the Great Depression and two world wars. As opportunities open up for her children across the United States, Pearl remains a central figure in their lives and the lives of her grandchildren. Her story revolves around taking care of those she loves during the joyous times and the more difficult moments of their lives. 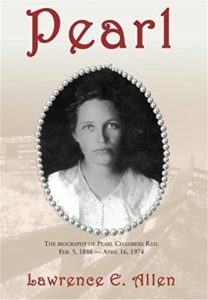 Told by her grandson, Dr. Larry Allen, the story of Pearl’s life is the tale of the Midwestern American family in the 1900s, a family you will come to cherish with each turn of the page.